One of the defining features of the “American Dream” is the ability to succeed despite being born to disadvantaged circumstances. However, growing up to be better off than one’s parents – upward absolute intergenerational mobility – appears to be a fading experience for many Americans in recent decades and one that varies widely across the country. In “Rural dreams: Upward mobility in America’s countryside,” (PDF) Eleanor Krause and Richard Reeves build off an earlier examination of the rates of social mobility across the country by Raj Chetty and his colleagues. While most of the research on geographical variations in mobility has focused on cities and other urban communities, the new analysis specifically focuses on the most rural counties in the country. 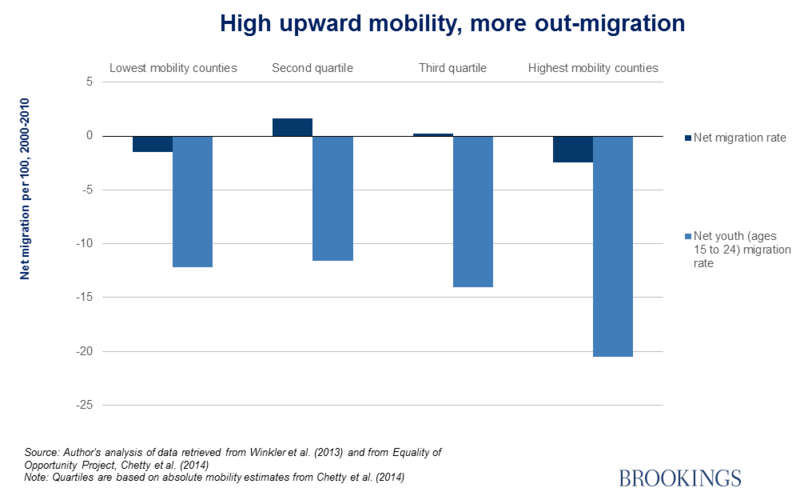 It finds that rates of upward mobility in rural counties are generally as high as in urban areas, but there is great variation across these rural counties. Certain rural counties have some of the highest mobility rates in the country, while others are “mobility traps,” where children born to disadvantaged circumstances are extremely unlikely to get ahead. and stronger local labor markets. So what can be done to help boost mobility in the worst performing counties? The authors find that net migration in counties with the highest rates of upward mobility is negative, though the high mobility rate does not result from families moving out of poor performing areas and into areas with stronger labor markets or better educational opportunities when their children are young. Rather, the authors argue, these counties are successfully influencing an individual’s life prior to entering adulthood or the labor market. The paper lists three arenas that seem particularly promising for bolstering opportunity in rural America. Invest in human capital development. Improving K-12 quality in distressed areas will improve young residents’ life prospects and preparedness for adulthood. Ensure rural communities are equipped with basic 21st century infrastructure. Technology such as broadband will enable families and schools in these areas to better connect to distant economies and opportunities. Invest in family planning. Rural residents are less likely to have access to affordable and quality health care, which makes intentional parenthood all the more difficult. The authors conclude that while these investments in people versus places cannot entirely close the gap in mobility in rural counties, they are essential to boosting opportunity.